Imagine coming into work and receiving one to five commercial leads right in your email box every day like clockwork. These leads arrive in your inbox instantly, so you can often catch the borrower while he is still sitting in front of his computer. Even better, these will be the exact type of commercial loans that you have selected. CommercialMortgage.com ("CMDC") is a commercial mortgage portal that competes directly against C-Loans.com. Please note that C-Loans, Inc. owns both of these portals. The sites have different lenders, and we get paid differently. CommercialMortgage.com is a very popular commercial mortgage portal because it is far easier to use than C-Loans. We ask the user just six questions, as opposed to thirty questions on C-Loans. In addition, CMDC boasts of 3,159 commercial lenders, far more than the 750 commercial lenders to be found on C-Loans.com. 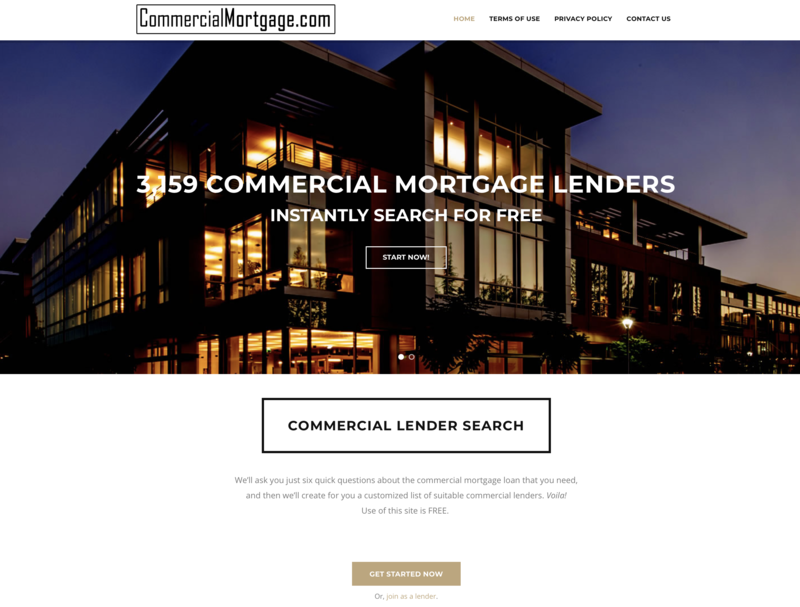 CommercialMortgage.com is 100% free to use by borrowers and brokers. Banks and credit unions get a free listings on CMDC, so the portal is stuffed to the gills with banks and credit unions. No other types of commercial lenders get a free listing. We pay heavily to promote the site. Because the portal is 100% free, it generates an impressive volume of commercial loan leads. The cost for a commercial mortgage company to be listed on CMDC is $1,000 per year per loan type. The available commercial loan loan types include permanent loans, bridge loans, construction loans, SBA loans, USDA loans, and mezzanine loans. For example, if your hard money mortgage company makes both permanent loans and bridge loans, the cost to receive permanent commercial loan leads would be $1,000 per year, and the cost to receive bridge loan leads would be another $1,000 per year. Do you have any idea how cheap is $1,000 per year? If you average about a lead and a half per day (some days you'll get five), that works out to less than $1.84 per lead! And, unlike C-Loans.com, if you close a deal, you don't owe us a dime. Unlike trying to advertising for leads using Google Adwords or display ads in digital magazines or e-zines, our commercial leads will be the exact type of commercial leads that you are seeking. You'll be able to tell us, "Hey, C-Loans, Inc., I want to receive bridge loans from $1 million to $20 million in the three states surrounding New York City." 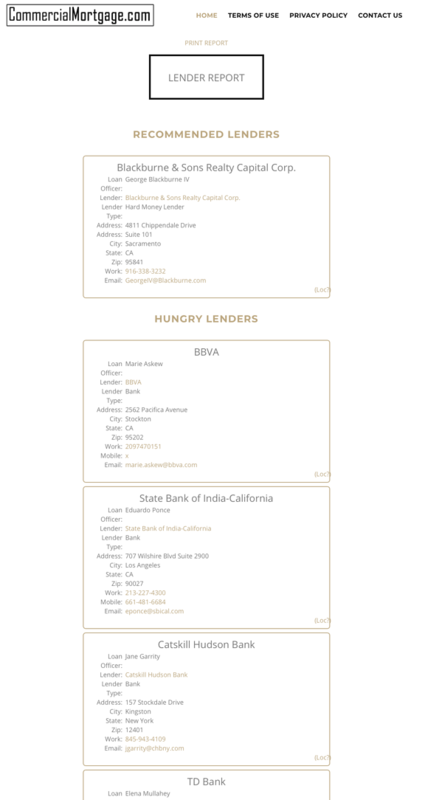 "Hey, C-Loans, Inc., I want to receive permanent loan leads in the Western States on the four major food groups, plus hospitality and senior care, from $2 million to $100 million." If you spend your advertising dollars elsewhere, because the leads are not filtered, you'll get deals like a $42,000 bridge loan on a commercially-zoned house in Detroit or a $2 million mezzanine loan on a parking garage in Maine. Technically these are commercial leads, but you'll never make a dime off of them. Important Disclosure: We do NOT sell permanent loan leads and bridge loan leads of less than $1 million. There are reserved for Blackburne & Sons, my own hard money shop. Between loans fees and loan servicing income, we make over $300,000 over 15 years on a loan of $1 million. Blackburne & Sons, however, doesn't make many permanent loans or bridge loans larger than $1 million, so these larger leads are the ones that are available. What if you are an SBA lender? Yes, you can buy SBA and USDA leads of less than $1 million. Blackburne & Sons does not make SBA loans, USDA loans, or construction loans of any size. Do you see the the section above entitled Recommended Lenders? On permanent loans and and bridge loans up to $3 million, Blackburne & Sons will always be listed first. Three million dollars is Blackburne & Sons' absolute maximum loan size. After that, the order depends on how soon you sign up. Red Star Mortgage, for example, was smart enough to be the very first commercial mortgage company to send in its dough, so on permanent loans greater than $1 million, Red Star appears second in the Recommended Lenders section. On permanent loans of greater $3 million, Red Star Mortgage even appears first! 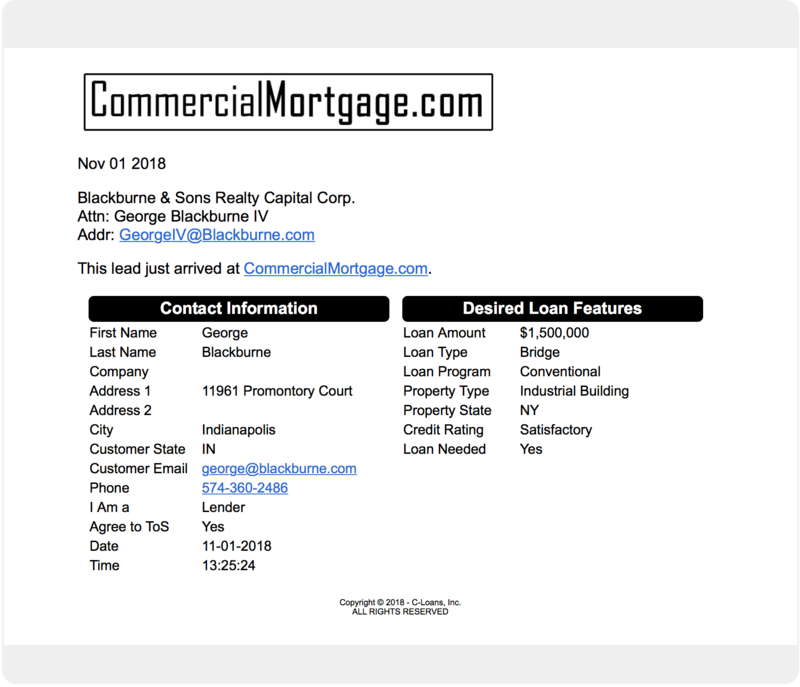 We just started selling placements on CommercialMortgage.com on November 1, 2018, and already a number of commercial mortgage companies have sent in their dough. Red Star Mortgage was the fastest, so they own the top spot. The second lender to send in its dough is now listed second, and so on. You should assume that there are there are a number of lenders listed higher than you; but remember, you get a copy of every suitable lead instantly, so you are not dependent on the borrower calling you or emailing you. There is always a sort of race going on, so the sooner you sign up, the higher up your commercial mortgage company will appear in the Recommended Lenders section. As times goes by*, you will find yourself marching higher on the list. For example, next year, if Red Star doesn't renew, then the #2 lender moves into the #1 spot, and every renewing lender moves up one place. Sadly, the life expectancy of the typical commercial mortgage company is less than two years, so you will march relentlessly towards the top of the list, as long as are sure to renew annually. Fair warning: If the site takes off, and some new lender offers me $1,500 per year, he grabs the #1 spot. I will probably just go up in $500 increments. * This is our - the Blackburne Family of Commercial Mortgage Companies - 39th year in business. This means that we survived the S&L Crisis, the Dot-Com Meltdown, and the Great Recession. I urge you not to dilly-dally around. Remember, there is a bit of a race going on. Don't you wish you had been first? "Okay, George, I'm sold. A cost per commercial lead of only $1.84 is incredibly cheap, especially when you consider that I will not owe C-Loans, Inc. a dime if I close a deal. I want to do this. What do I do?" First, complete this form that tells us which commercial leads you want. Then, you please rush your check or wire, made payable to C-Loans, Inc., 4811 Chippendale Drive, Suite 101, Sacramento, CA 95841. The absolute smartest among you will just call in your payment to our Accounting Department using your credit card. Justine Manzo is our Controller, and her number is 916-338-3232.